With start and prize money gained from all four races since arriving in Spain and with the 125 and 250 Parillas continuing to prove reliable, I was beginning to really enjoy the Spanish Series of races, notwithstanding my earlier encounter with the Spanish ‘lurgi’ from which I was now fully recovered. With more time and less financial pressure, I was looking forward to the remainder of the races with optimism than I had when leaving the UK. The constant sunshine was also most welcoming after the adverse conditions experienced earlier at Dundrod, in North Ireland. Leaving Valladolid and our idyllic location, we headed South West in convoy taking the scenic route to Jerez through the heart of Spain via Salamanca, Caceres, Merida, then spending some time in Seville, a city which I consider to be one of the Worlds finest, before we moved on to Jerez de la Frontera. It is time I feel for me to explain how our group ‘the Colonials’ and I, on arrival in Bilbao, came to unanimously adopt Ramon Robinson to be our de facto leader and spokesman when seeking directions, ordering meals and negotiating when necessary, with race organisers in Spain. Apart from being a very level headed sort of guy, Ramon and his parents had lived for a number of years in Venezuela where he had attended the local school and as a result spoke fluent Spanish, a unique accomplishment within our group! 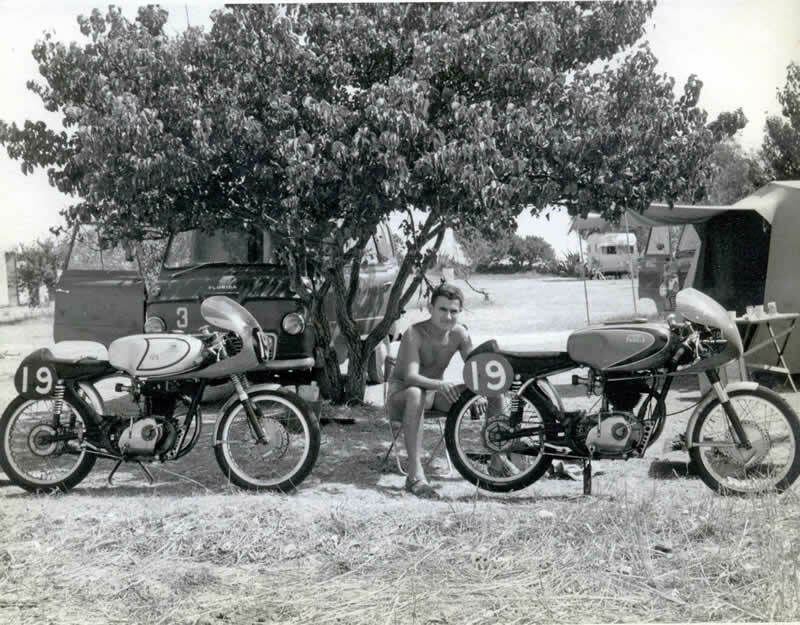 Ramon also knew his way around Spain, having previously travelled throughout the country when visiting to purchase and collect his 125 TSS from the Bultaco factory. Ramon and Andy came to a deal with Cyril Ashford whereby he allowed them to use the Capriolo/Parilla Workshop in exchange for them agreeing to service and repair (unpaid) some of Ashford’s customers motorcycles. On our arrival in Jerez, Ramon led us to a Bar fronting a very dark warehouse, full of large casks of various grades of ‘Fino’ being kept cool out of the heat of the Spanish sun. Here Ramon was greeted like a long lost son, I never found out how this came about, but it turned out that the Bar was owed by the Club secretary and/or one of the organisers of the races. Having had a good meal and now more than announced our arrival in town, we moved on to a camp site some way out to the South East of Jerez, here we were based for the duration of the races. Again in the 60’s the Jerez street circuit was situated very close to the centre of town and was very similar in shape to the Valladolid circuit. Up one side and down the other side of a dual carriage way connected by a sharp hairpin bend at one end and then at the other end, around a block of buildings including a small open air market and the entrance to a football stadium before returning onto the dual carriage way and the start and finish line once again. As in the case of the Bilbao and Valladolid races, the Jerez circuit races were also run in an anti clockwise direction. Again as in Bilbao and Valladolid, there was a tremendous atmosphere in Jerez during the ‘Feira’ and throughout the practice sessions and races. Indeed it was as if the whole town were involved, one way or another, with the races and in supporting the riders of all Nationalities. The enthusiasm of the spectators was so high there was a serious risk of injury at times to both riders and spectators when they pushed forward against the barrier ropes around the circuit to get a closer look at the riders to such an extent on some occasions they were actually sitting or standing on the circuit whilst the racing was in progress! On more than one occasion I came around a bend to find that the straw bales which had been placed on the outside of the circuit bend, had been pushed further in during the race! This all made for exciting racing although one or two of the riders who did fall claimed they were brought down by spectators moving the position of the straw bales! My practice sessions on both the 125 and 250 went well but once again, I was finding my standard Moto Parilla front brakes were not up to stopping the Parillas quickly enough at the extremely sharp hairpin bends on these short circuits. This allowed some of the riders with better brakes and/or lighter bikes, to pass me when we were approaching these tight bends. This was something I had not been accustomed to before coming to Spain! Once again under a clear blue sky the 15 lap 125 race got under way. 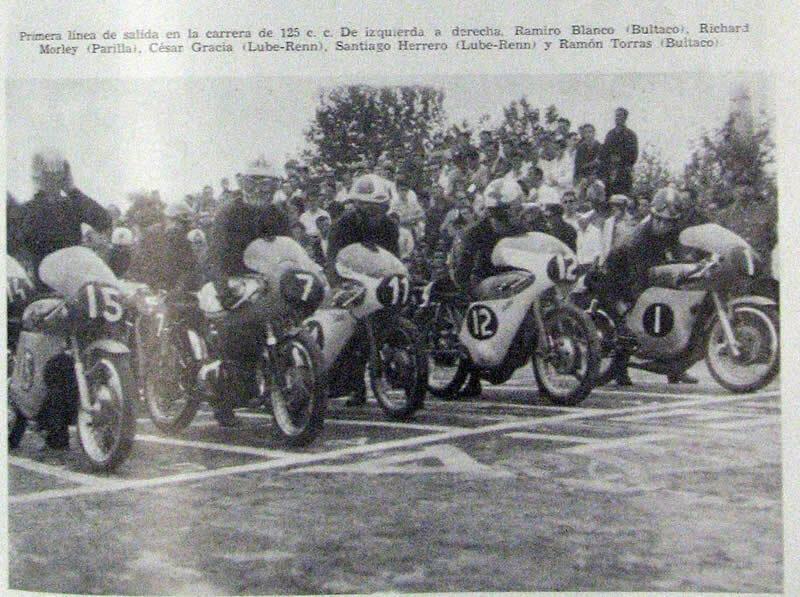 Starting from the front row of the grid but surrounded by Spanish factory riders, I had another very good start but just could not keep up the pace of Ramon Torras (Bultaco), Saniago Herrero (Lube-Renn) or Cesar Gracia (Lube-Renn) even when I had the opportunity to slipstream them during the early laps. 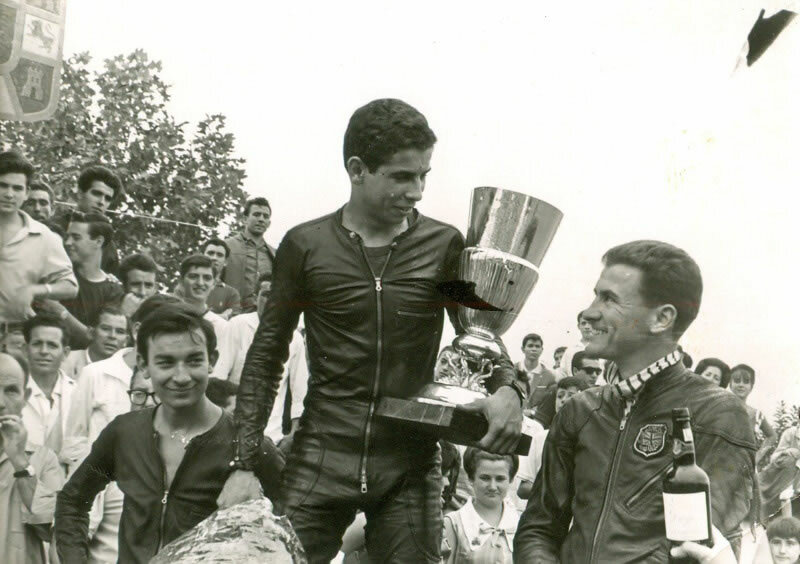 The race was won by Ramon Torras (Bultaco) followed home by Cesar Gracia on his factory Lube-Renn – A high cam 124 cc Parilla again finished in third place. The 250 race turned out to be more of a struggle when after a fairly good start from the 2nd or 3rd row of the grid, I soon became mixed up with a group of 5 or 6 riders including a Montesa, an Ossa and a Ducati, in addition to two hot Bultacos. 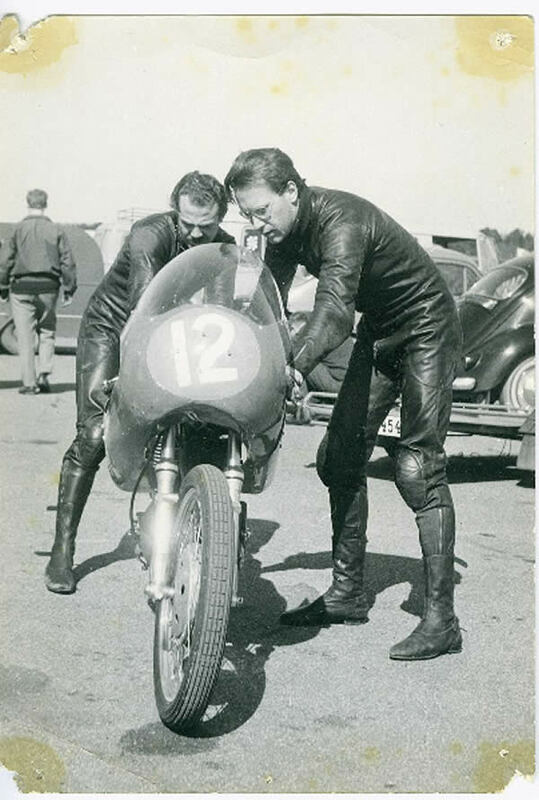 Ramon Torras on his Works Bultaco and Barry Smith on his Aermacchi had very good starts and were well out ahead of our group. Slipstreaming down the straights and then trying to outbrake each other at the hairpin bends, I cannot now remember just how many times we changed positions in our group as we all battled, during the whole of this 20 lap race. At some distance into the race when our group had been reduced to only 3 or 4 riders, we were very close together rounding the square with the open air market when suddenly, without any warning, the bike immediately in front of me sized up! The unfortunate rider and I were both at the point of changing down to 3rd or 2nd gear and leaning over as we were diving into the bend onto the start and finishing straight. One second he was there and in the next he was gone, hitting the straw bales and Armco type barrier dividing each side of the dual carriageway just at that point ricocheting off of the barrier across the track. I must have come within inches of hitting the rider and his bike but the incident was fortunately for me, all over even before I had time to react. By the time we came around on the next lap there was no sign of the rider and his bike but there was still straw all over the place at the point of the incident and for more than 100m’s further down the circuit! In addition to the start and prize money from both races, I was later presented with the most impressive silver ‘Valdespino Trofeo’ for I assumed my 125 race finish. It was only some time later we were informed Luis Saez had crashed on his Montesa in the 250 race seriously injuring himself and a number of spectators when his bike went off the circuit and hit a small mobile market stall. With Barry Smith also gaining, a podium place finish in the 250 race, the Colonials and I along with our local supporters had quite a party in Jerez de la Frontera that night, the details of which I had conveniently forgotten by the morning! There had been another meeting originally planned following the Jerez meeting for Malaga or Valencia, I cannot now remember in which City it was to have been but in any event it was cancelled (claimed at the time for lack of funds) This left the non-Spanish International riders with time to kill before setting off to Montjuic Park, Barcelona. Some of us drove down to Gibraltar whilst others, it seems, made for Mallorca for the final event in the European Hill Climb Championship. I went with the group to Gibraltar where 3 or 4 of us took the ferry across ‘the straights’ to Tangier for a day, my very first of many visits to come to Africa. Returning from Tangier to the Rock late in the evening of the same day, we stayed the night in our vans before setting off for Barcelona early the following morning.